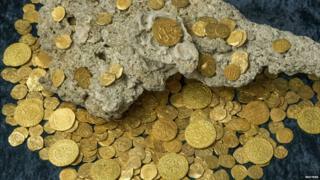 Treasure hunters in the US say they have discovered a haul of Spanish gold coins from the 18th century that are worth $4.5m (£2.9m). The 350 coins have lain on the Atlantic sea bed off the coast of Florida for the past 300 years. The coins are from a fleet of 11 Spanish galleons that sank during a hurricane while making the journey from Cuba to Spain. Treasure hunting is a popular activity in the waters around Florida. The discovery is the second major find by treasure hunters in recent months. In June, they found about 50 coins worth about $1m. The 350 coins, which were brought to the surface at the end of July, turned up in just a metre of water close to the shore, buried under the sand. Under US state law, Florida will keep 20% of value of the find. The diver who discovered the coins, William Bartlett, declined to say what his cut would be, telling a local newspaper: "I'm just a guy on a boat living the dream." Brent Brisben, who owns the rights to the wrecked ships, says the find includes nine rare pieces known as "royal eight escudos". Only 20 were known to be in existence before this latest find. "These royals are perfect specimens of coinage of the time and they were made on royal order for the king of Spain," Mr Brisben said.